Mechanical Engineering, Adhiyamaan College of Engineering, Hosur. The Department of Mechanical Engineering started during 1991 -1992 is presently having an intake of 240. The Department is accredited by National Board of Accreditation of AICTE, New Delhi. The department offers one post graduate programs Engineering Design (ME-ED). The department is led by Dr. Channankaiah supported by 56 qualified, experienced faculty members who have passion to teach. 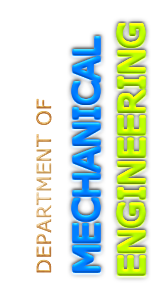 The Department of Mechanical Engineering provides high quality education along with discipline. The faculty members make it possible to give individual attention to the learners and to motivate them to achieve their professional goals. The curriculum structure of the department is designed to meet the present day requirement of Industries and corporate sectors. The interaction between the staff and students is excellent and all the laboratories are well equipped as per requirements of the curriculum. The Central library is fully automated and Mechanical related books of 20091 Nos., titles of 6865, National & International journals of 50 and e-journals of 187. Moreover, online book reservation facility through intranet is also available in the library. The library maintains an exclusive question bank which comprises a collection of University Question papers. Fully Fledged placement cell assisting personality development training and communication development classes. Regular counseling / monitoring for students. Round the clock state of the art computer lab with LAN networking with Internet and web-browsing facility. Fees charged ( per annum ) in Rs. To make the Department as center for Excellence in Infrastructure, Technical Education and Placement. To develop competent and creative world class Mechanical Engineers who use their talents to achieve the excellence. To impart highest quality education to the students to build their capacity and honing their skills to make them globally competitive Mechanical Engineers. Graduates of B.E. Mechanical Engineering should have a comprehensive background of mathematics, science, and basics of mechanical engineering to solve applications related mechanical engineering and multidisciplinary areas. Graduates of B.E. Mechanical Engineering need to develop expertise and acumen in core areas like design, thermal and manufacturing engineering to the satisfaction of employers and blossom into entrepreneurs, scientists and technocrats with ethical values. Mechanical Engineering program orients its graduates towards professional growth either through employment or higher studies or research and contemporary areas of socio-technological issues like energy crisis, pollution and industrial relations. An ability to apply knowledge of mathematics, science and engineering to real world applications. An ability to identify, formulate, analyze and solve complex mechanical engineering problems. An ability to design mechanical engineering components, processes and create products or systems within economic, environmental, ethical and manufacturability constraints. An ability to visualize and work in the laboratory so as to interpret and analyze data to facilitate report. An ability to demonstrate skills to use modern engineering tools, various mechanical software and equipments to analyze problems. An ability to understand the professional responsibility to access societal, health, safety and legal issues in this technological world. An ability to perceive the impact of professional engineering solutions in societal and environmental contexts and demonstrate the knowledge needed for sustainable development. An ability to apprehend code of conduct and ethical responsibilities. An ability to work as an individual, as a member or a leader in diverse teams and in multi-disciplinary task. An ability to communicate effectively through verbal, written and graphical forms. An ability to develop confidence for self education and lifelong learning. An ability to understand engineering economics and management principles to handle projects effectively. An ability to solicit the knowledge of mathematics, science and mechanical fundamentals in the realm of Design, Production and Thermal fluid sciences to solve engineering problems utilizing sophisticated technology. II. An ability to clutch societal realization to promulgate the organization through entrepreneurship for the advanced technophile world. An ability to develop and implement new ideas on product design with the help of modern computer aided tools for ensuring best manufacturing practices.